For my Mom, Shrink's birthday, we wanted to take her out to dinner. There were a few rules though. First and second, it had to be nice and it had to be fun. Third, it couldn't be too expensive. 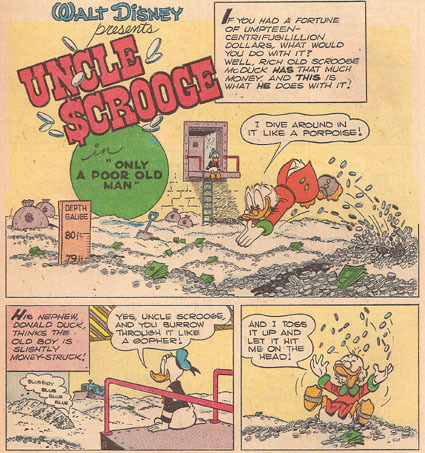 All of those letters after my name and framed Latin phrases on the wall have yet to be translated into Uncle Scrooge's swimming pool. Fourthly, while this may not have been the first time she turned 29 again, Shrink's not the kind of chick who wants to surround herself with people who'd be scared and cry for their nurse each time a flash goes off. Still, eating at at place dominated by the right-out-of-college set isn't her idea of a good time. 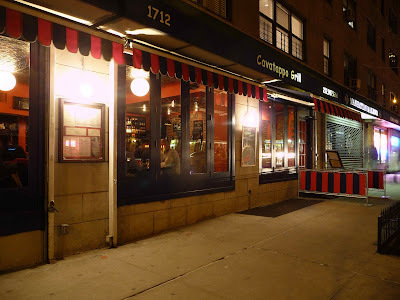 In the end, I pushed everyone out the door and into Cavatappo Grill. 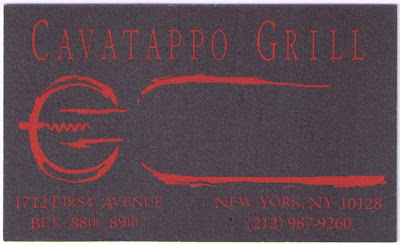 There are two Cavatappos: the wine bars (there's one on East 28th street, too) and the restaurant, Cavatappo Grill, where we went. However, because the wine bar is so obviously associated with the bar, the wine list is an impressive one. Dudeman and I split a bottle of Montepulciano, while Bro and Shrink chose a Long Island white. 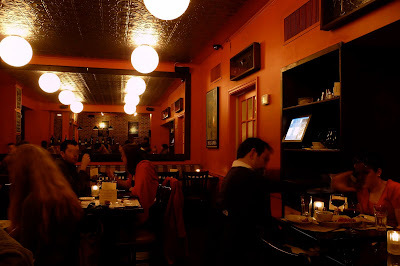 We drank as our eyes wandered the menu. Dudeman and Bro ordered bowls of Minestrone Soup, which they liked. They expected pasta, but it was purely veggies. Dudeman followed it up with a Cheese Plate of grappa padano, caciotta crotonese and bleu d'ambert, served with marmalade and raisin bread. The three cheeses he selected were from a menu of thirteen off-the-beaten-track cheeses. 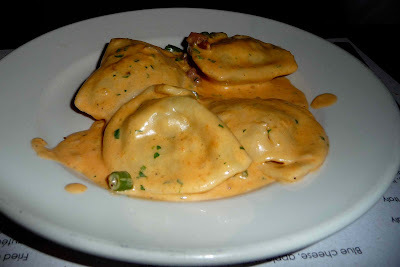 Shrink's appetizer was the Veal Ravioli, served in a prosciutto cream sauce. She liked it. Personally, I'd never order veal, but the money had been spent and my argument against getting it went unheeded, so I tried it and yeah, despite it all I know why people eat it. Bro ordered the Puff Pastry Tart with pear and gorgonzola cheese. Flaky but not such that shrapnel bits fly across the table. The cheese and the pear paired well. It was sweet and sticky, but also bitter and smooth. I skipped having a starter, instead ordering two appetizers as a main course. Actually, this worked out well, since both were pastas and filled me up to the point of near explosion. Appetizer one was the Tagiatelle Bolognese, a simple red meat sauce pasta dish. 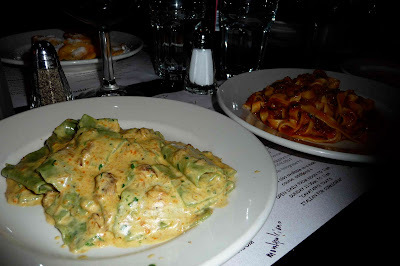 It was very good, but I'll be honest, next to my other choice, the Spinach Pappardelle with Duck Ragu, it was about as boring as a used Toyota with a dented door. This was about as good a pasta dish as one can get. I, naturally, shared it with the rest of the table. I, naturally, was reluctant to do so. I initially wasn't sure about duck in a cream sauce, especially given how fatty duck can be. This was an unwarranted fear. The duck wasn't fatty and they went perfecty together. 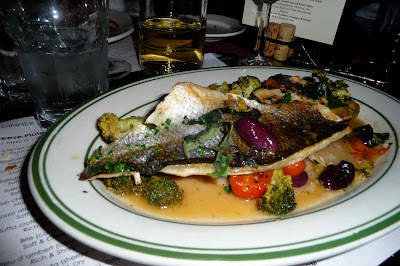 Bro's entree was the Striped Bass Fillet, with vegetables. I won't lie. This didn't impress me as much as it did the others at the table. I find that the majority of fish meals tend to fall into two categories: dull or damn! and this was dull. Shrink's entree was the Braised Short Ribs with Red Wine and Winter Spices, served with a puree of vegetables and mashed potatoes. So tender, they could be eaten with a spoon. Dudeman just picked at our plates. Dinner was rounded off with coffees, tea and a Tiramisu, all of which was thoroughly enjoyed. Two soups, a cheese plate, four appetizers, three entrees, a dessert, three coffees and the wines plus tax and tip ended up being $216 even.